Challenge 4 is Spring Flowers so I have made this tag. 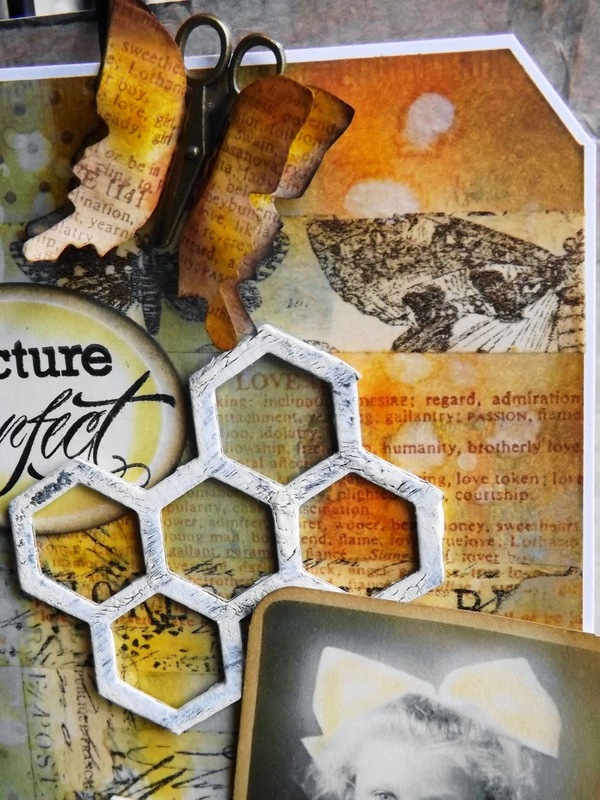 I have never had good luck with the Pinecone Die from Tim Holtz, but I thought I would give it another try. I would scan and reduce them to fit my tag. This little girl won my heart over so she became my first pick for this Spring tag. She was Chalked and stained, don’t you just love this face? 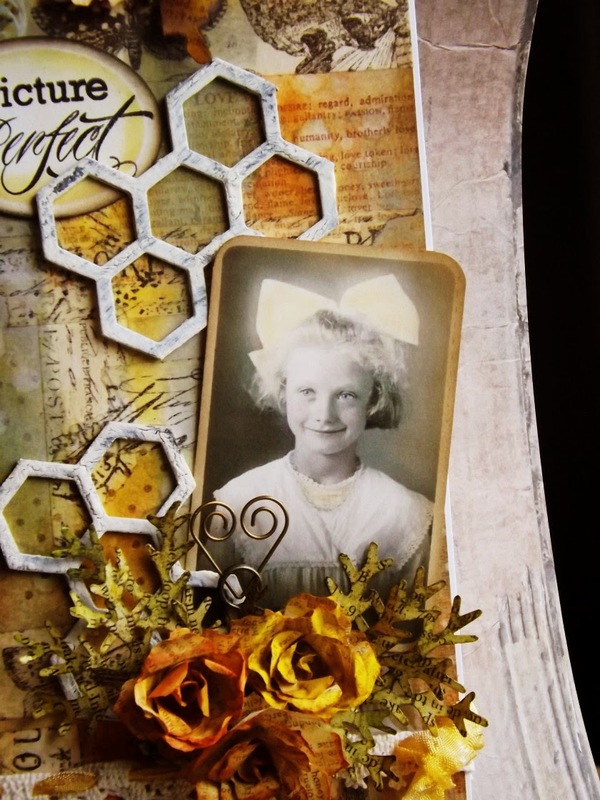 I used the Frameworks Honeycomb die, which was painted and crackled. 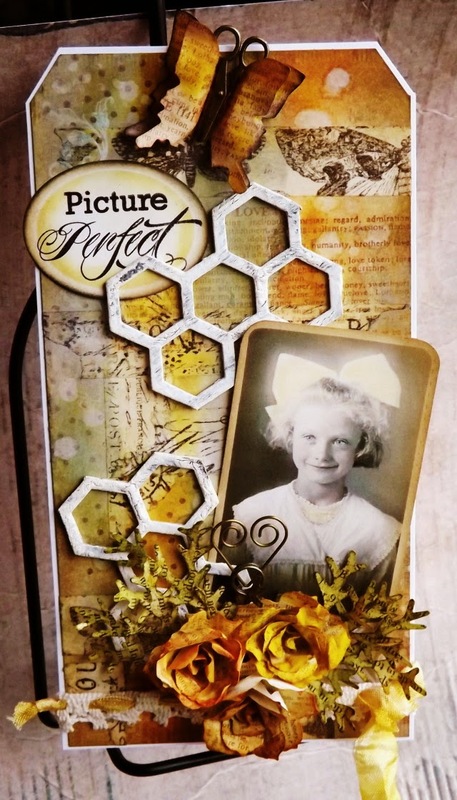 The Butterfly is from the Mini Movers and Shapers Die from Tim Holtz. Also used The Sketchbook tissue tape on this tag. Thank you for stopping in, I would also like to apologize for my absence as of late, we were hit by lightning last week end and we are just getting things (some what) back to normal now. Thank you again for your time. Have a wonderful week. this is SO pretty. I love the depth of colour you have achieved and the attention to detail. I think the colour goes very well with the honeycomb die too. a truly gorgeous make. The touch of colour to the girl is so lovely and delicate as is that sweet butterfly. GF, you have not been having the best of luck concerning your WI weather! Glad all is better now! Wow and wow again on your tag and those pinecone roses! 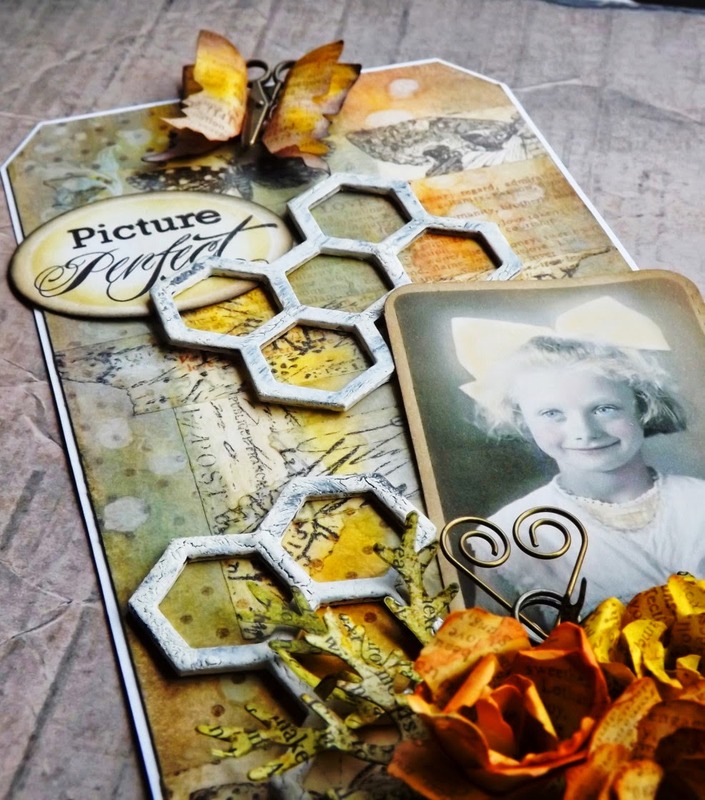 I love the rich and warm colors and that frameworks die is used perfectly! BTW, I am not a fan of those pinecone roses as I fumble with them terribly, but yours are rocking! Thank you for sharing with us at A Vintage Journey. Hugs! This is just beautiful. It has a romantic feel, and I do not know why as a little girl image should not make you feel romance!!!! Anyway Love all the elements that you have used and placed so perfectly. 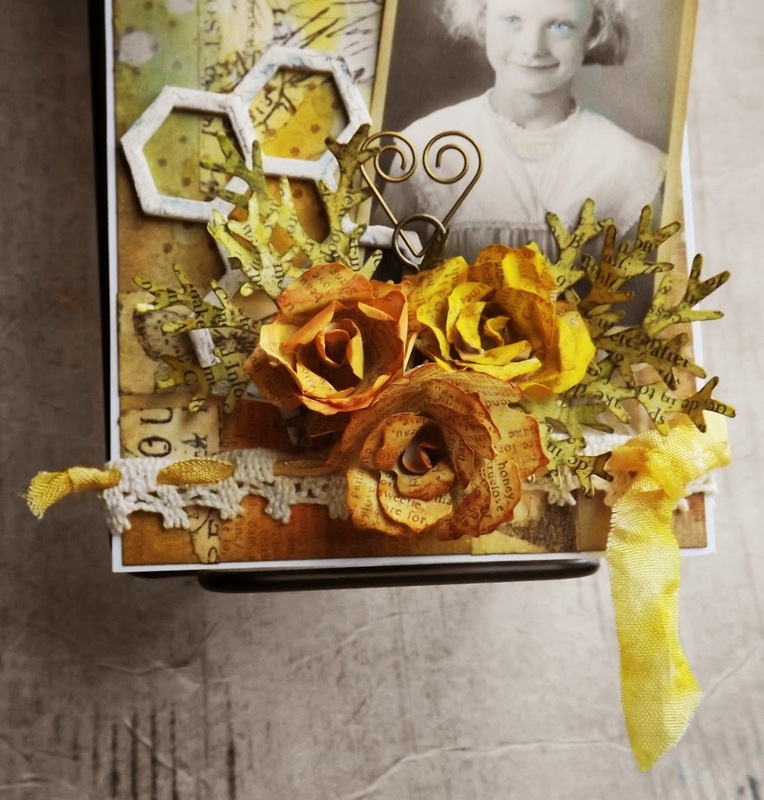 That is just too cool, I love the scissors with the butterfly and the picture nestled in the flower arrangement! Oh wow, wow , wow, this is totally fabulous! 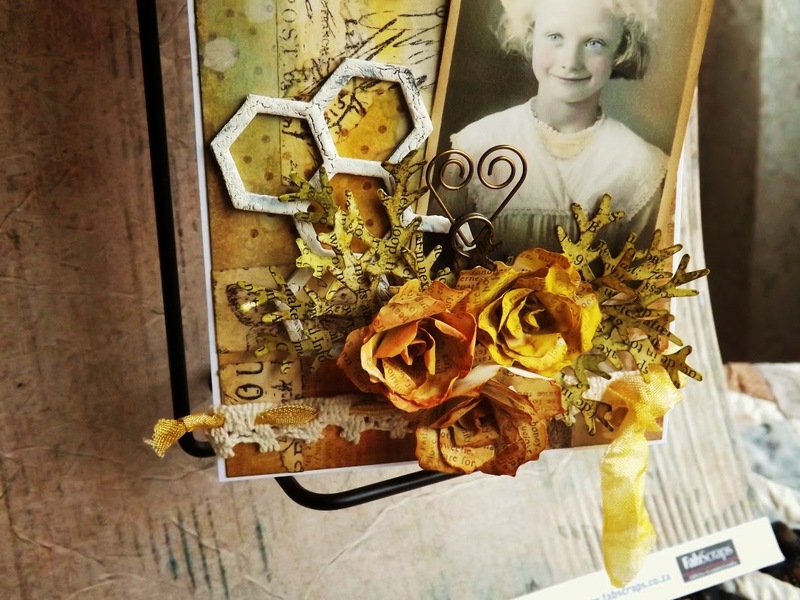 Your flowers look amazing and just perfect around that gorgeous vintage image! 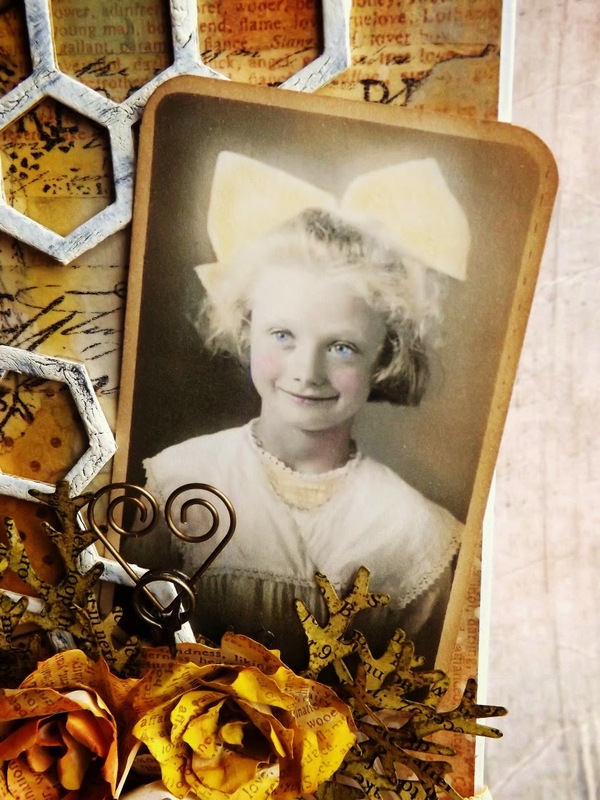 A great make and thank you so much for adding it to the A Vintage Journey challenge! Absolutely in love with the golden glow of this - gorgeous framing of the photo with all those glorious flowers - stunning! Thank you for joining us on A Vintage Journey.